This Roasted Spiced Shrimp Recipe has been one of my go-to recipes in recent months. It’s a super easy, stress-free recipe that I like to make on my busiest workweek evenings. I’ve been doing a lot of oven-cooking because the clean-up is so simple. I only have to clean one bowl and toss a single piece of parchment paper, if I pick the right sides. Typically, I choose two pre-prepared sides from the local grocery store. And I opt for the ones that can be re-heated on the same baking sheet as these shrimp to keep things simple. 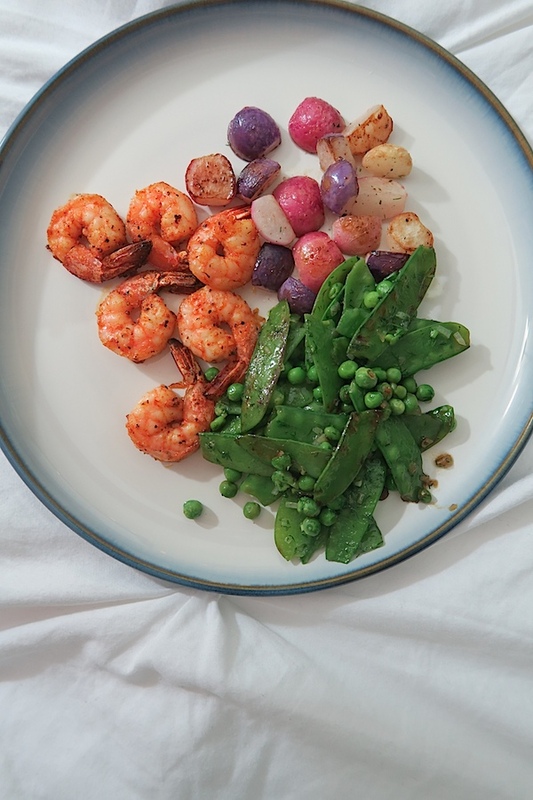 For sides to go with this Roasted Spiced Shrimp Recipe, like roasted potatoes or green beans, I like to add them for the last 5 minutes of cooking. This is usually enough time to heat the sides through. In the above photo, I actually purchased the side of peas but did a quick batch of my Sautéed Radishes for the second side. As for the shrimp, I just mix up the seasonings with olive oil, toss in the shrimp, add them to the parchment-lined baking sheet, and they’re ready in only ten minutes. The speed is a real win, since I often eat these after a workout, and after burning all those calories, I want food fast. To save time, I usually pre-heat the oven while I’m showering and settling back in after being out all day. Because while I want food fast, I usually want a post-workout shower first. If you’re playing along with Eat in Month this year, this would be a good recipe to bookmark or Pin for later. Use your favorite spice blend to easily flavor these shrimp. I like the Homestead Blend available at Savory Spice Shop. It has a nice, savory flavor that pairs well with almost any side dish. The spice amounts work for about 6-7 large shrimp. So, if you prefer more shrimp or want to cook for more people, just add more EVOO and seasonings as needed. You may also find you need to customize the amount of your favorite seasoning mix used since some are stronger than others. Pre-heat oven to 425 degrees F. Prepare a baking sheet with parchment paper. In a medium bowl, add olive oil, seasoning mix, salt, and pepper. Mix well with a fork. Add shrimp and toss to evenly coat. Add shrimp, laying flat, spread out on the prepared baking sheet. Bake for approximately 10 minutes, or until the shrimp are cooked through. Thanks for stopping by! Hope you enjoy this Roasted Spiced Shrimp Recipe!